MobileMonkey is the premier Facebook Messenger marketing chatbot platform. 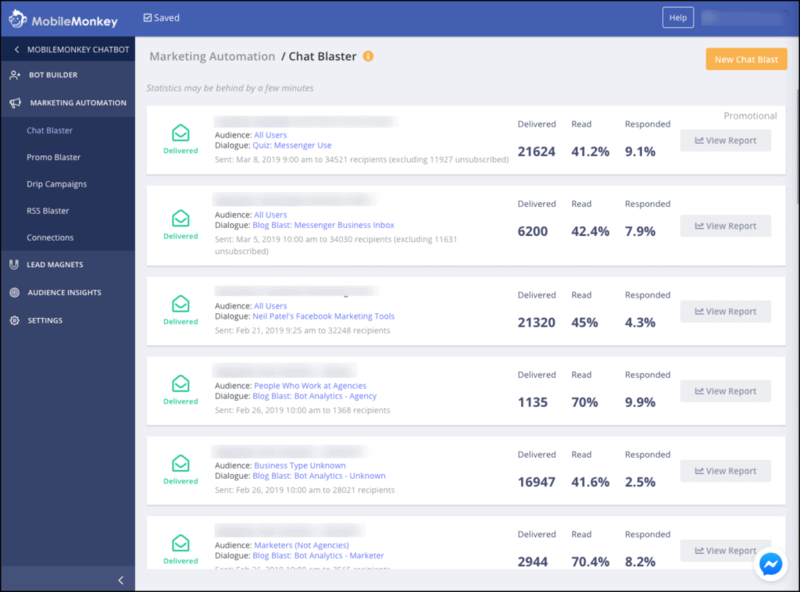 MobileMonkey allows marketers to create powerful chatbots, interact with their customers, segment their audience, grow their contact list, and drive conversions. The possibilities are endless, and the potential is enormous. If that’s true (and as a digital marketer, I believe it is), then MobileMonkey is a must-have tool for any marketing entrepreneur or marketing agency. 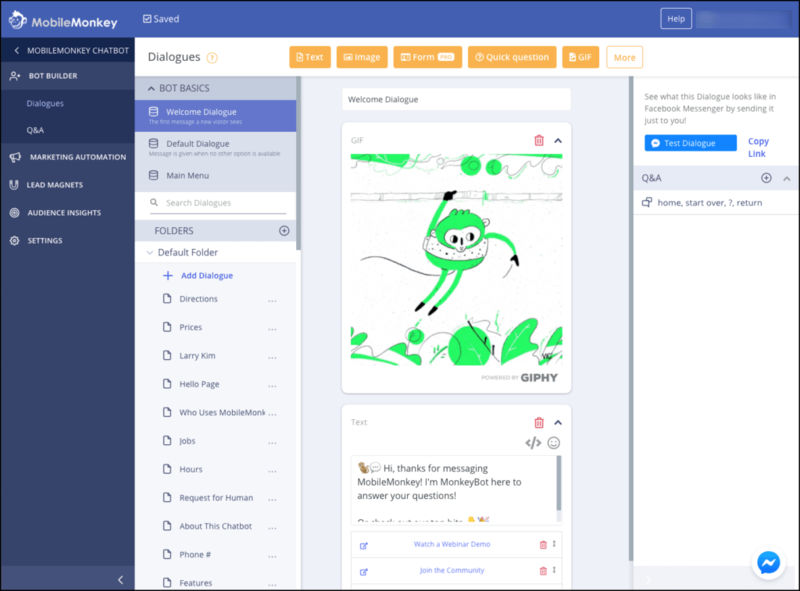 MobileMonkey calls itself “The World’s Best Facebook Messenger Marketing Platform.” While that statement might sound self-aggrandizing, it’s probably also true, based on my hands-on review of the product. 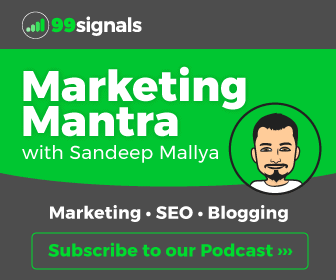 Essentially, what MobileMonkey does is unlock an entirely new marketing channel — one with sky-high conversion rates, insane engagement metrics, and massive payoff. Facebook Messenger is used by over 1.3 billion users around the world, and since it’s a messaging app (as opposed to, say, email or a static website), the engagement is intrinsically higher. I’ve used and reviewed dozens of apps and tools, from extremely powerful enterprise software packages to lightweight apps. What I’ve found is that there’s a balance between having too many features and having too few. MobileMonkey strikes the perfect balance. There’s a lot that you can do with MobileMonkey, but it’s also fast, easy, and straightforward to simply create a chatbot. First off, MobileMonkey is a Facebook Messenger marketing platform. What this means is that you use the app to send Facebook Messenger messages to your Business page followers. But that’s only the tip of the iceberg. I’ll go over some of the main tools within MobileMonkey so you can get an idea of the scope and depth. 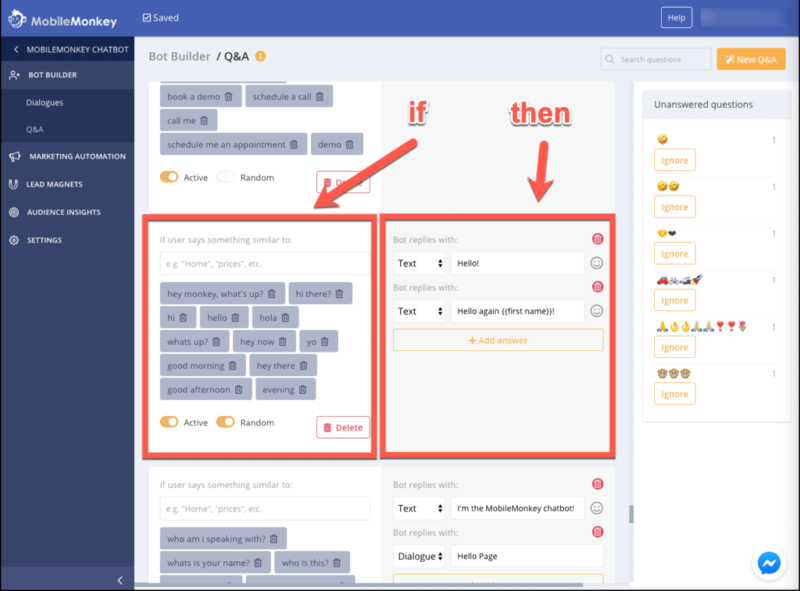 The chatbot builder is the heart of MobileMonkey and allows you to create as many bots as you want from scratch or using templates. This is what the bot builder looks like when you open it. In the chatbot builder, you can create a dialogue or a Q&A. Dialogues contain the message content and media of your Chatbot. Configure your Welcome Dialogue and construct a simple dialogue by asking Quick Questions to qualify a lead. Keep it simple, engaging, and fun! Opening the Dialogue builder takes you to this screen. The Chatbot builder allows you to click and add various elements from the menu bar directly into your dialogue bot. The Q&A section of the Bot Builder is also a breeze to use. Here’s what the Q&A builder looks like. The bot replies to emojis, responds with emojis, simulates typing, and can personalize according to the user’s name and information. MobileMonkey’s Chat Blaster allows you to send a message to all of your Messenger contacts or just a segmented group of contacts. The idea is simple: One message to a lot of people. And because it’s in Messenger, the open and clickthrough rates on these things are sky high! Whatever your marketing KPIs, you’re going to blow them out of the water. This is what the Chat Blast setup tool looks like in MobileMonkey. If you’re familiar with drip campaigns in email marketing, then you’ll understand drip campaigns in Messenger marketing. The concept is the same, but the medium of Facebook Messenger makes the process so much faster and more effective. MobileMonkey’s drip campaigns allow you to set up a sequence of messages delivered at specified intervals to keep the audience engaged. Drip campaigns can coax leads down the funnel, offering a download, scheduling a call, or segmenting themselves into a more focused group of contacts. 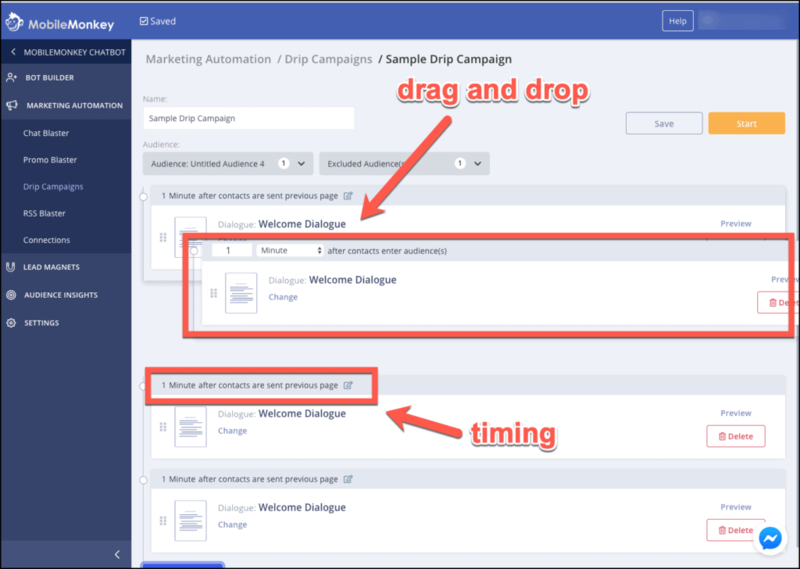 Facebook Messenger has strict rules regarding promotional messages, so MobileMonkey makes sure you abide by those rules when setting up your drip campaign. Before you can create a new drip campaign, you must select between a promotional message and a non-promotional message. After that, you can create your Drip Campaign by selecting an audience and then ordering the various messages. MobileMonkey’s platform makes this a cinch with the timing toggle and the drag-and-drop interface. The RSS Blaster in MobileMonkey lets you share your RSS updates with your audience. To use it, you’ll simply add your existing RSS feed, input some read more text, and toggle a few other options. MobileMonkey takes care of the rest by sending updates to your audience automatically. You can create as many RSS Blasters as you want. MobileMonkey is quickly expanding its repertoire of integrations. To manage these connections with external systems, analytics, or data, you’ll use the Connections tool. It is only available to pro users. Connections are a two-way street. You can push data out of the bot, such as your contact list. You can also pull data in. 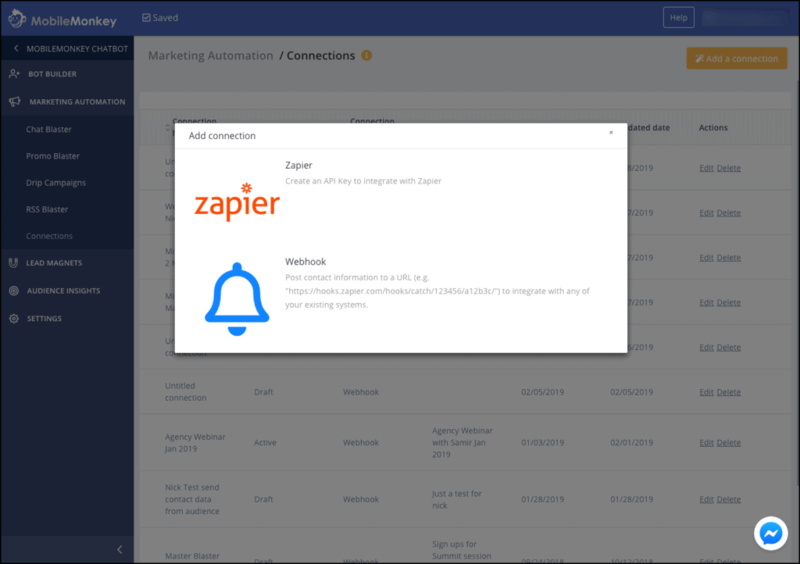 The two connection types currently supported are Zapier and Webhook. Creating a Zapier connection, for example, is just a matter of naming your connection and copying the API key. You can add an unlimited number of connections. 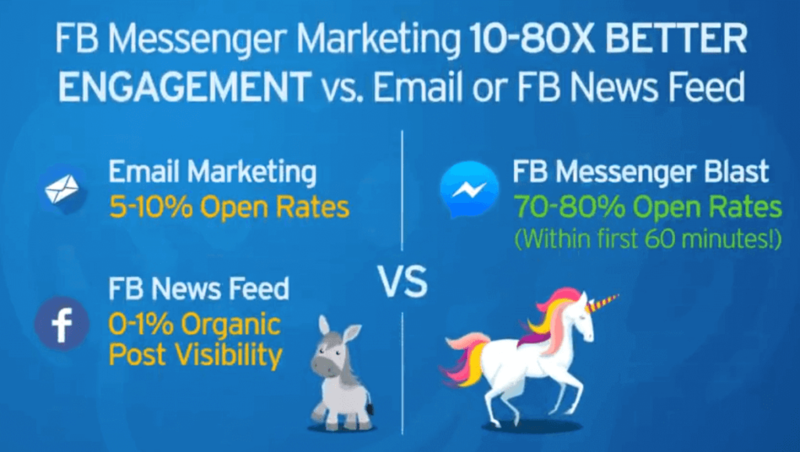 Facebook Messenger advertising has higher ROI than traditional Facebook ads. They are up to 90% less costly than ordinary Facebook display ads. You can create Messenger ads directly in MobileMonkey, then import the code into Facebook Ads Manager. It is a lot easier to create these ads in MobileMonkey because of the simple drag-and-drop interface. Creating them in MobileMonkey also means simpler integration with other Messenger bot features in MobileMonkey. A Comment Guard is something you add to your Facebook organic posts. When someone comments on your post, they will be added to your Messenger contact list. Comment Guards are an excellent way to benefit from your Facebook page engagement. 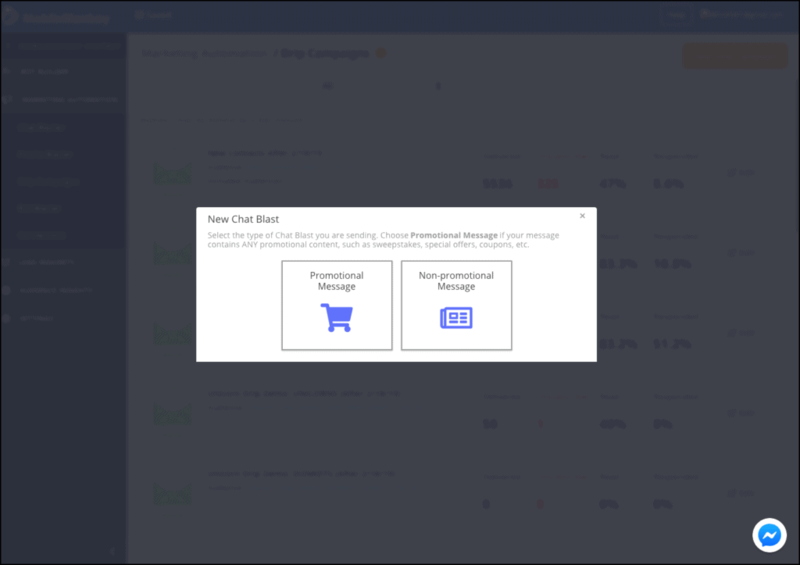 Plus, it’s totally free, unlike Click to Messenger ads which do require a cost. If you ever want some inspiration about the power of comment guards, check out this article. 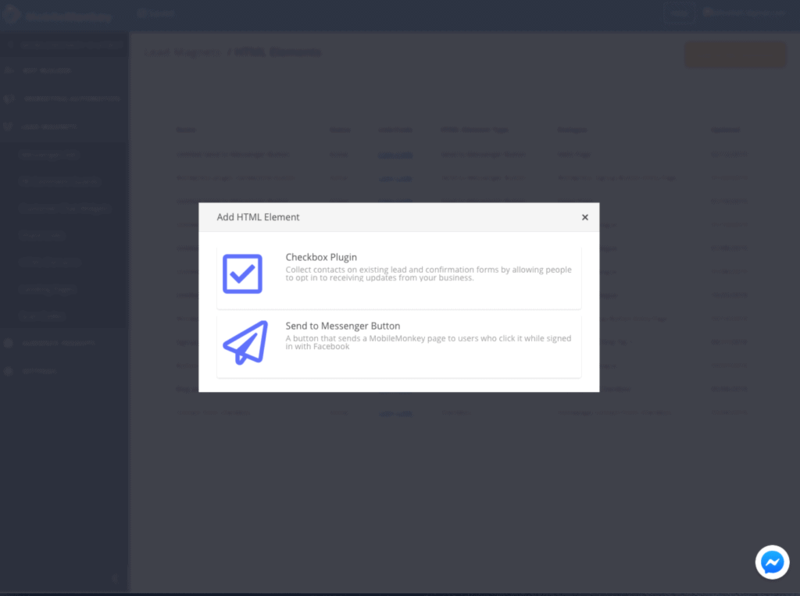 This tool allows you to add a chat widget to your website. When I visited the MobileMonkey website, the chat widget was everywhere. It seemed a little annoying, but I quickly realized how effective it was. 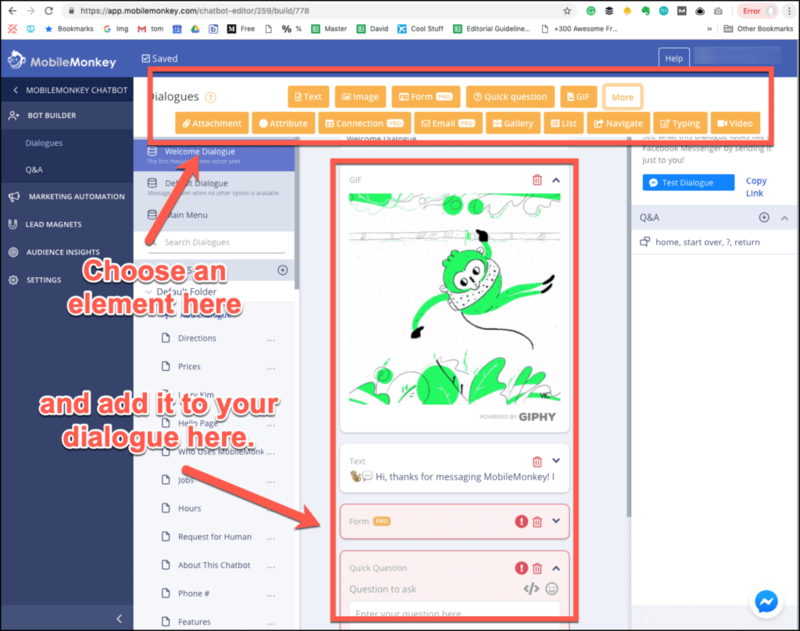 Messenger chat widgets are better than other chat widgets, because you gain a contact forever — not just a one-off interaction while they are on your website. Plus, users can access the Messenger chat history on any device and at anytime. To create a widget, you’ll add a quick dialogue and select your preferred options. From there, you just copy the code, and add it to your website. Alternatively if you use WordPress, you can use the WP-chatbot customer plugin for WordPress. 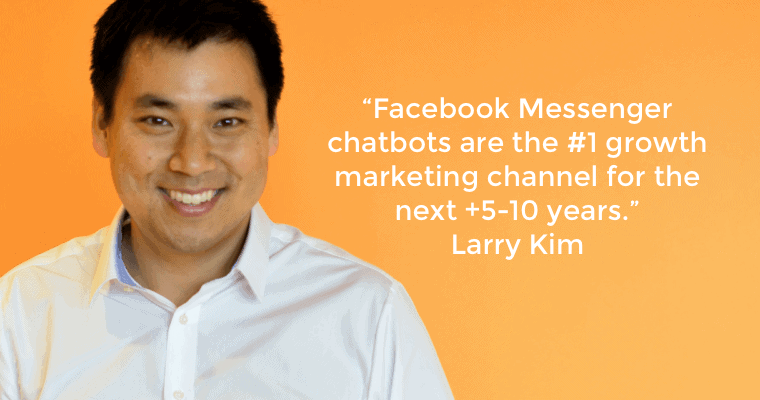 The more you use Facebook Messenger marketing, the more you’ll discover its vast reach and engagement. This discovery will make you want to push even more people to your Messenger contact list. To do this, you can create Share Links, which allows you to capture leads from non-Facebook advertisements, email marketing, or pretty much anywhere else. The Share Link tool creates a link that sends contacts to the dialogue of your choice. Like Share Links, HTML elements create a shareable link that you can include in other marketing channels like your website or emails. You can create two types of HTML elements. First, checkbox plugins work with your lead forms, and allow people to click the checkbox to consent to receive Messenger updates from you. Second, Send to Messenger buttons allow users to start a Messenger conversation at the click of a button. MobileMonkey even allows you to create landing pages for the sole purpose of capturing more Messenger leads. The page is simple (and creating it is even simpler! ), but that’s kind of the point. In MobileMonkey, you can create scan codes and choose the dialogue to send users. 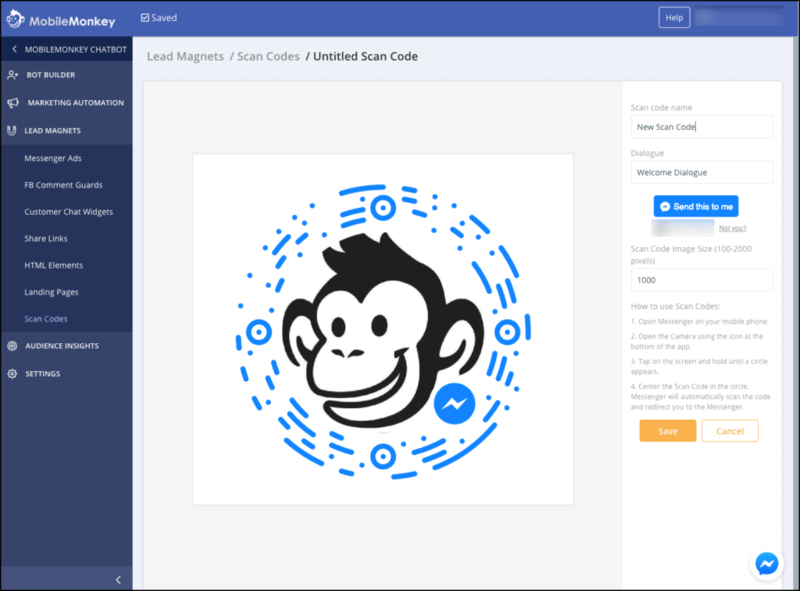 Users can scan your code using the Messenger app, where they can start a dialogue with your chatbot. MobileMonkey is brimming with tons of data. I’m kind of a data nerd, so this was one of the really appealing features of the platform. You can get deep intel on every campaign, contact, chatbot performance, audience segmentation. There are four main categories of data. Contacts — Search your contact list and find out how each contact engages with your content. Forms — View the stats for your chat forms including number of impressions, conversion rates, etc. Bot Analytics — Uncover how and why your Messenger contact list is growing or shrinking, the open rates according to date, conversions, sessions, etc. Within the tools listed above, MobileMonkey offers a full suite of data on each the specific features. For example, with Chat Blaster, you can view the delivery rates, read percentages, and response rate directly from the Chat Blaster creation dashboard. You can also clickthrough to more detailed reports on specific chat blasts. 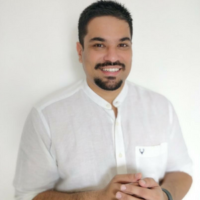 I was a newbie at chatbots before I started using MobileMonkey. When I heard the term “chatbot” I was thinking okay, but I’m not that keen on programming. MobileMonkey is ridiculously easy to use. You don’t have to do any coding whatsoever! The setup process. Completely uncomplicated and error-free. I was concerned that with Facebook’s tight security, it would be hard to get my page integrated with MobileMonkey. In reality, it was a cinch. Literal drag-and-drop interface. Some people say “drag-and-drop interface,” when what they mean is “it’s kind of buggy and clunky, and also you have to do some kind of complicated things.” This wasn’t the case at all with MobileMonkey. The interface was simple and intuitive. All the main tools are available on the left side of the screen in a menu-style. Everything is nested logically and makes entire sense. One thing I really liked about MobileMonkey was the templates. Sure, you can create any type of chatbot from the ground up. Or you can use one of these templates. If you click on any of the links below it will start a chatbot sequence that you can experience. MobileMonkey has three pricing plans — Free, Pro ($49/mo), and Premier ($149/mo). 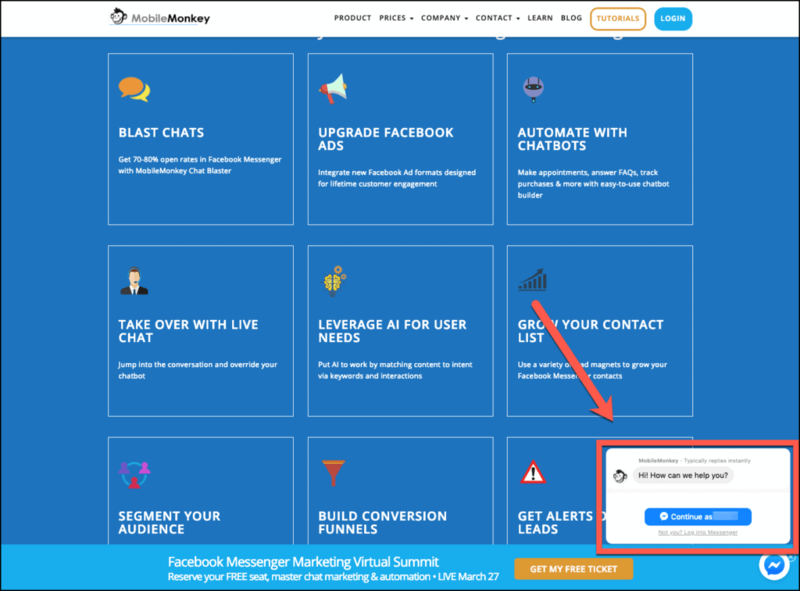 MobileMonkey’s free plan is perfect for any marketer who simply wants to harness the power of Facebook Messenger marketing. With the free plan, you can build chatbots, integrate chatbots into your website, create Facebook Messenger ads, send bulk messages, create lead magnets, and send message blast. Keep in mind that the free plan is branded with MobileMonkey. Price: $49 per month per Facebook Page (CURRENTLY DISCOUNTED TO $19/MONTH). To purchase more than 5,000 contacts, it costs $19/mo for an additional 20,000 contacts. 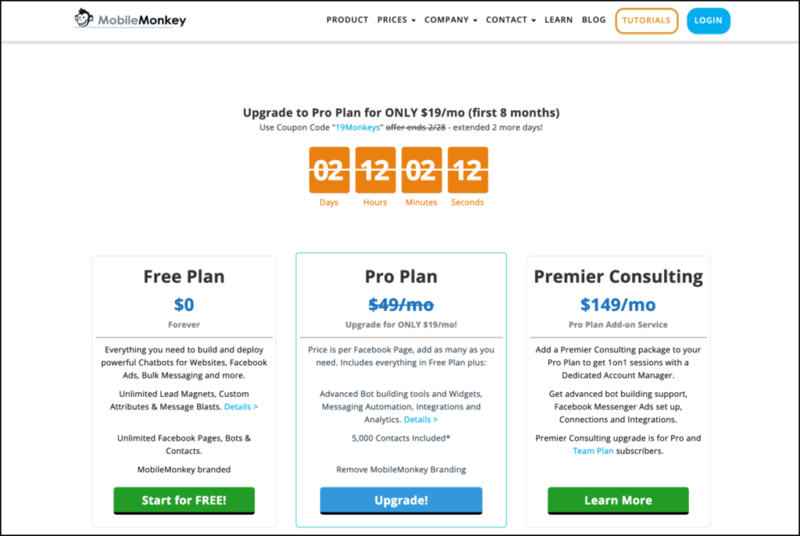 The pro plan from MobileMonkey includes all the features of the free plan, of course, but adds advanced bot building tools, widget creator, messaging automation, analytics, and up to 5,000 contacts. MobileMonkey branding is removed on the pro plan. Heavy users of MobileMonkey will probably want to upgrade to the Premier Consulting plan. The only benefit gained at this price point is one-on-one sessions with a dedicated account manager. This is worth the extra price. A dedicated account manager helps you create custom strategies for your niche and marketing goals, provides step-by-step training, and allows you to unlock all the full potential of MobileMonkey. The Premier plan only gives users one hour long session per month, which seems a little bit low. However, when you do the math, you’re getting an hour of a professional consultant’s time for only an additional $100. (Some consultants charge five times that much per hour.) Plus, you can invite your whole team to attend the sessions. The bottom line on MobileMonkey pricing: Exceptional value for very low price. The pricing model is outstanding. Most marketers will get all the power they need by using MobileMonkey’s free plan. The pro plan is offered at a very low price, especially considering how much power it offers. 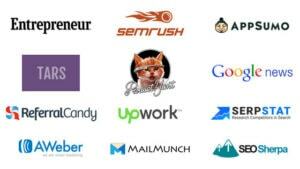 Many marketing tools today, such as SEO research or analysis SaaS, cost hundreds of dollars per month. MobileMonkey is definitely on the lower end of the price spectrum as far as tools go. MobileMonkey is not nickel-and-diming their users with upcharges, add-ons, and hidden fees. The only additional fee required is if pro users need to purchase more contacts, which comes out to only $0.00095 per additional contact! There are several ways in which MobileMonkey offers customer support. The most logical one is directly within the app itself. You can click on MobileMonkey support at any time and ask a question. You can also email support@mobilemonkey.com and get an answer to your questions. When I emailed them, they replied with an in-depth response in just twenty minutes. In my experience, some of the best support came in the form of the “MobileMonkey Island” Facebook Group. You can access it here. The group consists of MobileMonkey users asking questions and getting feedback. A lot of times, MobileMonkey’s founder, Larry Kim is in there, too, helping to answer questions. Plus, it’s written for normal humans, so it’s easy to read and understand. If you want one-on-one customer support on a regular basis, you will have to purchase the premier plan ($149/month). This isn’t just customer, support, however. It’s a consulting session, so the level of help you can get is outstanding. MobileMonkey is huge on education. There’s always some sort of summit, webinar, or livestream going on. If you feel like you’ve missed any of the good stuff in the past, you can always check out the summits page where they update it with past summits, on-demand training, and courses. MobileMonkey is a powerful tool, and it’s free. That alone should tell you all that you need to know. After I took some time to test the software, I was honestly blown away. It’s been a long time since I’ve seen something this robust go for such an insane price. I’m not trying to be sensational, just honest. I’m not sure if MobileMonkey has plans to increase price or to remove the free membership, but my recommendation is to take advantage of the tool now. One reason I think it’s important to get started with MobileMonkey is because of the explosive potential of Facebook Messenger. It’s about to get huge. Actually, it already is huge. My verdict: Try it. Get it. Do it. Click here to get MobileMonkey for free. MobileMonkey is a powerful tool, and it’s free. After I took some time to test the software, I was honestly blown away. It’s been a long time since I’ve seen something this robust go for such an insane price. I’m not sure if MobileMonkey has plans to increase price or to remove the free membership, but my recommendation is to take advantage of the tool now. I do believe that AI-driven technology Chatbots is becoming more and more meaningful to brands and even individuals. A unique way to engage with brands and get your questions answered without getting on long wait calls. I would like to introduce Engati.com a chatbot platform here. It allows you to build, manage, integrate, train, analyze and publish your personalized bot in a matter of minutes. It presently supports 12 major messaging platforms including Website, Facebook Messenger, Whatsapp, Telegram, Line, Skype and more with a focus on customer engagement, conversational commerce, and customer service and fulfillment.